UW Bothell Staff Member’s Journey to Everest! Posted on October 28, 2014 by Shelly Gunn. This entry was posted in Being Active, Life Events and Changes, Staying Healthy and tagged Tenzing Hillary Everest Marathon. Bookmark the permalink. Tom Whittaker said, “Everest for me, and I believe for the world, is the physical and symbolic manifestation of overcoming odds to achieve a dream.” I am captivated by Mt. Everest and traveling there has been my lifelong dream. After losing 85 pounds since 2011 and finishing 17 half marathons in 2 years, I recently decided that traveling to Everest in 2017 and being physically fit enough to successfully finish the Tenzing Hillary Everest Marathon will be the ultimate tribute to my 50th birthday and the perfect way to symbolize a lifetime of overcoming the seemingly unbeatable odds against my success! It is difficult to comprehend the significance of the Everest Marathon without understanding what led me to where I am today. I have struggled with my weight ever since I was pregnant with my oldest daughter in 1987. I suspect that my first pregnancy triggered my body to produce antibodies to fight my own thyroid gland, which can cause autoimmune hypothyroidism to develop. My life took a dramatic turn in 1996 when I got divorced, moved in with my mother because I lost everything, and was penniless. I started attending college for the first time as the single mother of three small children. I believe the stress I went through during that time pushed my body into severe hypothyroidism. My habit of putting my personal needs last on the list of my priorities did me no favors health-wise. I suffered debilitating symptoms that progressed from bad to worse over a few years, including severe hive breakouts (over my entire body and on my eyes), dry skin and hair (my hair actually turned to hay for many years), and severe fatigue! I cannot describe what it took within me to get myself up some days. By late 1999 the mystery symptoms finally completed a puzzle and I was diagnosed with hypothyroidism and put on Synthroid to improve my symptoms. Despite all the numerous obstacles I faced, I still managed to maintain stellar academic performance, graduating from the University of California, Irvine in 2001 with a degree in Psychology & Social Behavior. I was the student valedictorian commencement speaker and was awarded a $20K fellowship for graduate school. The feeling of accomplishment that day was much like I felt after finishing my first half marathon – a bit of disbelief at how such a thing was accomplished but overwhelmed with emotion knowing what it took to get there despite the many obstacles I faced! Within six months of graduation, my weight ballooned and nothing made a difference this time for several years – not Atkins, South Beach, starvation, cabbage soup, Jenny Craig– NOTHING worked! My body was stuck in that depressing obese condition for about a decade. I saw an endocrinologist regularly but my weight was the only thing completely unaffected by thyroid hormone replacement. During that time, I started working at UC Irvine as an advisor and began a Ph.D. program in Psychology & Social Behavior. I met my husband Michael in 2004 and we got married in 2007. I left the doctoral program with my Master’s degree in 2006 when I had the opportunity to be promoted to a program manager. Then in 2009 my husband was offered the job of his dreams in Seattle, which was a financial blessing for us, but very difficult for me because I had to uproot my children and leave the job I loved so much. Flash forward to April 2011. I saw a Groupon deal for boot camp class in Tacoma. I knew people who did boot camp in California with a lot of success, but it was prohibitively expensive until I saw the deal. I figured it was worth a try. I started boot camp classes at Jowers Training Systems in May 2011, attending 50 minute classes 3 days a week. That first month was horribly difficult for me (I still hate burpees!). The initial weigh in was 30 pounds more than I weighed when I delivered each of my three kids – I didn’t even know how that was possible… or how it got so out of control. My body was nearly 50% fat! I looked and felt so frumpy, out of shape, and just plain stupid trying to get through the classes. People at JTS were very supportive and non-judgmental, which helped a lot. The most difficult thing about that time was not seeing any difference on the scale for the first four weeks – despite the herculean effort that was KILLING me!! I had to spend time to build muscle back up, and in the short term the muscle I was gaining weighed more than the fat I was losing. JTS had a machine that measured body fat percentage, which helped me psychologically get through those first few weeks because I could see that number dropping, even though the scale wasn’t moving yet. The good news is that after five months of boot camp I lost 45 pounds!! The high intensity interval training (HIIT) seems to really be the “magic pill” for reversing a sluggish metabolism due to hypothyroidism. JTS never had the same workout twice (muscle confusion), which also is very helpful for improving weight loss. Unfortunately I injured my shoulder and had to take a break. I maintained my 45 pound weight loss for about eight months doing yoga DVDs and eating healthy by avoiding excess carbohydrates and sugar. My advice to anyone wanting to try boot camp classes is to really pay attention to form and listen to your body. It may help in the short term to just be doing something, but without proper form injuries in the knees and shoulders can hurt long-term progress or cause permanent damage. I started running in July 2012 after my shoulder pain was diagnosed as a small tear in my rotator cuff. The pain from that caused me to completely switch gears in my weight loss and fitness efforts after taking a break from boot camp. My brother Matt suggested I give distance running a try while my shoulder healed (trust me, I was laughing saying “yeah right …”). I figured it couldn’t hurt to try the Couch to 5K iPhone app and just see what happened. The workouts in C25K are only 30-35 minutes, so I did them every day. Within a month I ran my first 5k race at Alki Beach. Two weeks after that I finished my first 10K race at Iron Girl Seattle with two laps around Green Lake. Matt invited me to come down to SoCal and do a half marathon in October just for fun. I was nervous, but went ahead and signed up for the race, the Seattle Half Marathon Thanksgiving weekend, and the Vegas Rock n Roll Half Marathon in December. In October 2012 I finished my first half marathon in Long Beach with Matt beside me at the finish line! The last few miles were brutal, but he talked me through. As we crossed the finish line he picked me up and spun me around, screaming “you did it! you did it!” He knew all that I had been through, all that I had overcome, and especially how wildly unbelievable it was for me only a year before! 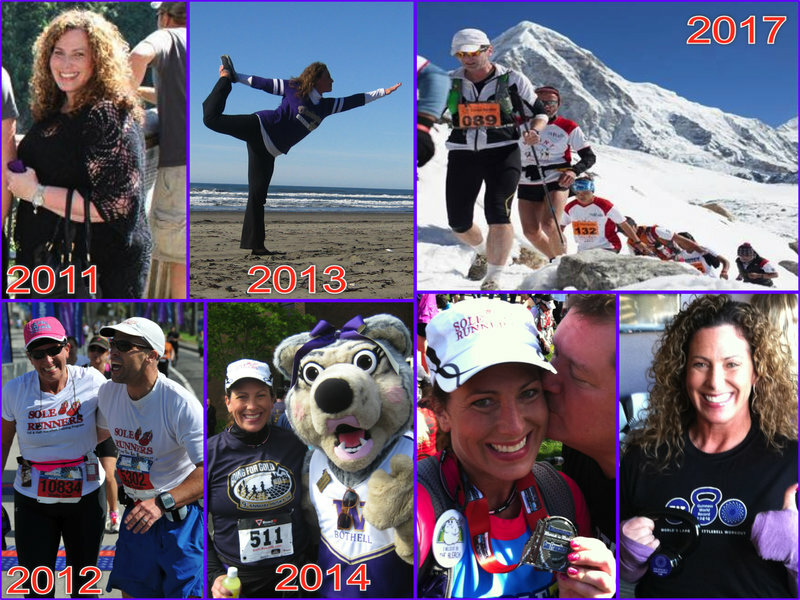 Through the influence of Sole Runners, I learned to incorporate yoga and ChiRunning into my training, which has transformed every aspect of my life for the better – especially helping me recover from IT Band and hip pain. Following the recommendation from my Sole Runners coach, Steve, I attend Laura Houston’s ChiRunning workshops in Seattle and at the UW campus. I have finally found a way to manage severe hypothyroidism without injuring my body while having a wonderful time! To further the yoga practice I started after boot camp, I started attending classes at Hot Yoga Inc. in late 2012. Regular hot yoga practice has healed my shoulder injury and transformed how I feel from the inside out! I wish I had understood the benefits of yoga and meditation long ago because I know I could have mitigated or prevented many of the health problems I suffered with for so long, while being more at peace with myself. I work out nearly every day with a balance of running, weight training, and hot yoga. When I try to imagine what I will need to do in preparation for Everest over the next three years, I really just stop and think about how far I have come in the last three years. 85 pounds lost, 17 Half Marathons completed, zero hypothyroid symptoms– my body has healed itself after decades of pain and illness and I am in the best shape of my entire life! I never thought anyone would call ME an athlete, so if I can do this, ANYONE can! I was thrilled to participate in the Endurance Running Whole U group on Facebook to help prepare for the Seattle Rock n Roll Half Marathon and am still a member. Join us if you’re looking for running tips, or the more general Whole U Being Active group if you want some extra motivation. This is only the beginning of my journey. I thought it was important to document in detail how this was done, and the steps in progression, so that others who have suffered with weight problems and want to take the leap will have realistic expectations and also believe it is possible for them. Shelly Gunn is a coordinator for transfer services and transfer admissions advisor at UW Bothell. Her blog, nowheregirl.me, chronicles all the details of her fitness efforts over the last three years. Follow it for her journey to the Everest Marathon in 2017. So inspirational!!!! Thanks so much for sharing Shelly. What an incredible journey you’ve travelled, Shelly! I can relate to the part when you said, “My habit of putting my personal needs last on the list of my priorities did me no favors health-wise…” It’s so true. When we don’t prioritize our own health, we do suffer consequences. Cheers to you for making huge steps to improve your health and happiness! Best wishes for continued success! So amazing and inspiring. Congratulations and good luck with the next challenge! Thank you for sharing your story! I totally agree with Lorna! Shelly, you are what the Whole U Being Active is all about! Thank you for sharing your incredible story. You are a true inspiration and we look forward to hearing how your journey progresses. To Our Health!